David Johnson (tenor), Lynne Dawson (soprano), Alan Watt (baritone), Donald Maxwell (baritone), Anne Pashley (soprano), Eirian James (mezzo-soprano), Anne Collins (contralto), John Winfield (tenor), Philip Riley (baritone), Geoffrey Moses (bass-baritone), Musicians of London/Simon Joly. I often tell people that I do not like opera: and then spend the next fifteen minutes listing the exceptions. From Gilbert & Sullivan’s Yeoman of the Guard to Iain Hamilton’s The Constantine Conspiracy and from Mozart’s Magic Flute to Harrison Birtwistle’s Punch and Judy, I have been enchanted by a combination of music, acting, scenery and effects for nearly 50 years of listening to classical music. I guess, what I mean when I say I do not like opera is a) I would rather hear a symphony, sonata, or concerto and b) I have not spent much time studying and thinking about the genre. Geoffrey Bush is a case in point. Although there are not too many of his works recorded, I have long rated his Symphonies No.1 and No.2 ‘The Guildford’, as well as the Overture: Yorick, and the splendid Music for Orchestra. All these works have been issued and re-issued by Lyrita over the years. Another facet of Bush’s achievement are the songs and chamber works. These have been explored by the Chandos and Lyrita labels. Although I have read Geoffrey Bush’s two volumes of autobiography, Left, Right and Centre, (1983) and An Unsentimental Education (1990), I never really ‘clocked’ that he had composed six operas and stage pieces plus incidental music for The Merchant of Venice. At least the information never sunk in. The present opera, Lord Arthur Savile’s Crime has impressed me. I would love to see a full performance. The libretto, the music and the performance line up to present a hugely satisfactory and ultimately entertaining stage work. Whilst at Lancing College, Bush had played the part of Gwendolen Fairfax in The Importance of Being Earnest. This led to his admiration for Oscar Wilde, and ultimately to the present production. The opera is presented in one act with three scenes. Bush has removed some of the action from the story and has simply referred to it in passing. This conveniently brings the work down to under the hour. The first scene is set in Lady Windermere’s house where the guests are enjoying a party. Scene two plays out in the shop of an anarchist in Soho. The third is set on the banks of the Thames, near Blackfriars Bridge, EC4. In his book Left, Right and Centre (1983), Bush points out that this is a happy coincidence: it was the address of the Guildhall School, who had commissioned the opera. It was premiered there on 5 December 1972. The size of the band was limited by the dimensions of the Guildhall School’s orchestra pit. Bush wrote for only 30 players, omitted a section of violins and included a piano. There is no chorus: where it would be required in the libretto during the opening party scene it falls to an ensemble of soloists. The other work on this CD is the Concerto for Trumpet, Piano and String Orchestra, dating from 1962. The liner notes explain that it is an orchestrated and heavily revised version of Bush’s Sonata for trumpet and piano written in 1945. The present incarnation was first performed at the Royal Festival Hall on 16 December 1963, with David Mason, trumpet and Ian Lake, piano. The Concerto is in three movements: an opening toccata, a dreamy nocturne and a finale. The heart of this work is the moody and lugubrious Nocturne that oozes ‘smoochiness’ and evokes smoke-filled jazz clubs of a past generation. I guess that I feel this work is a little imbalanced. The opening toccata and the finale are totally different in mood, perhaps neo-classical, but certainly not overtly jazzy. The middle movement holds its own against cross-genre masterpieces such as Richard Rodney Bennett’s Jazz Calendar, Mátyás Seiber’s Improvisations for Jazz Band and Symphony Orchestra and Leonard Salzedo’s Rendezvous for a similar combination. By the way, if you do not know these three works, and like jazz-infused classical music, try to hear them. The CD booklet provides the ‘complete’ libretto, which is helpful: dialogue is omitted. It could have been keyed into the tracks. On the other hand, all soloists sing their parts with such clarity of diction that the libretto is hardly necessary, except for study purposes. The briefest of glances at the list of performers require no recommendation from me. There is a generous essay on Geoffrey Bush as well as a good introduction to the opera and concerto. The sound quality is perfect, bearing in mind that these works have been quarried from Richard Itter’s archive of ‘off-air’ recordings. These are proving to be a major treasure trove of British music. 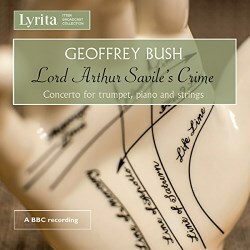 Geoffrey Bush Lord Arthur Savile’s Crime is yet another superb release from Lyrita that explores one more facet of one of Britain’s much undervalued composers.